Claudius Amyand described himself as 'of St Martin in the Fields' in his will (Prob 11/703, 9 July 1740). 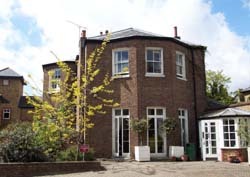 He does not appear to have had a direct connection with Twickenham, but his descendants have lent the family name to a house, a road (Amyand Park Road), a row of cottages (Amyand Cottages) and a Baptist Chapel (Amyand Park Chapel) there. Strafford Road nearby was known as Amyand Road until 1878. Claudius Amyand was the son of George, of a Huguenot family from Mornac in Xaitonge, France, naturalised at Westminster on 9 September 1698. He became a surgeon at St George's Hospital in London, served with the army in Flanders during the War of the Spanish Succession and was appointed Sergeant-Surgeon (Surgeon in Ordinary) to George I in 1715, a post which he held subsequently under George II for the rest of his life. As a surgeon he is remembered for performing the first successful appendicectomy, in 1735, on an 11 year old boy whose appendix was perforated by a pin which he must have swallowed. He also lent his name to a rare condition known as Amyand's hernia, a rare form of inguinal hernia which occurs when the appendix enters and becomes contained in the hernia. In 1722 he carried out the inoculation of Princess Caroline's children. Lady Mary Wortley Montagu had interested Caroline, Princess of Wales, in the procedure: she arranged the famous experiment on prisoners in Newgate Gaol before permitting the treatment for her children. Amyand married Mary Rabache on 6 November 1717 at St Benet Paul's Wharf, London and they had six daughters and three sons, Claudius, George, and Thomas. Claudius (1718-74) became Keeper of the King's (Cottonian) Library in 1745 and in 1747 entered Parliament as M.P. for Tregony in Cornwall, holding the seat until 1754. From 1754 until 1756 he was M.P. for Sandwich. A supporter of the Duke of Newcastle, he became his Under-secretary of State, a post which he held under successive administrations until 1756. On 26th November 1761, he married Frances, widow of George Compton, 6th Earl of Northampton, so becoming Lord of the Manor of Long Sutton. He is noted as a resident of West Sheen in Surrey. His portrait was painted by Thomas Gainsborough. Amyand's second son, George (1720-66), was the Member of Parliament for Barnstaple between 1754 and 1766, an assistant to the Russia Company in 1756, became a director of the East India Company in 1762 and was created a Baronet in 1764. His daughter, Anna Maria married Sir Gilbert Elliot, 1st Earl of Minto. His son, George changed his name to Cornewall, becoming the 2nd Baronet of that name. The third son, Thomas (1728-1762), entered the church, became Rector of Hambledon, Hants, and then Fawley, Bucks. In 1758 he married Frances Rider, younger daughter of William Rider Esq of Twickenham. They had a son, Thomas and a daughter, Frances who married William Henry Haggard Jr (1757-1837) of Knebworth Place, Herts and, later, Bradenham Hall, Norfolk. Frances Rider's elder sister, Maria also married a clergyman, on Christmas Day 1760, the Rev Samuel Hemming (1723-85) who became Minister of the Montpelier Chapel in Twickenham in 1761. William Rider, the father of Maria and Frances, had married Frances Baker in about 1717. He is first recorded in Twickenham in 1743, as a ratepayer. He may have been living in Twickenham before this at another address: Cobbett states that he occupied a house on the north side of King Street where, later, the Countess of Catherlough lived. He made his will in March 1743 (PCC Prob11/815) noting that he had purchased a “customary or copyhold messuage at Twickenham wherein I now dwell and appurtenances thereunto belonging an acre a quarter of an acre and three Polls of three acres of customary land formerly converted into an orchard in Twickenham aforesaid….” The property, bequeathed to his wife for her lifetime was then to pass to his two daughters. The wording of the will suggests that the house was already built in 1743. Subsequent records show that this property stood at the northern end of Park Lane (later Royal Oak Lane then Oak Lane in 1878) facing Shoes Lane (later Isleworth Lane, then Amyand Park Road). Its garden land stretched down the east side of the lane beside the adjoining orchard. This land had, earlier, been worked by two or three generations of the Crofton family during the 17th century. It can be seen on Moses Glover's map of 1635, a section described as “Mr Crafton's Nursery”. In August 1749 Rider added a codicil to his will bequeathing to his wife freehold and copyhold land that he had acquired from Annabella and Matilda Vernon, the two surviving daughters of Thomas Vernon and his widow Jane who had died in 1741. Rider's will also mentions an estate at Alrewas Hays in Staffordshire which he had bought with money forming his marriage settlement onFrances. The property exists today, known as Alrewas Hayes, a centre for hosting weddings and corporate events, south of Orgreave, to the west of Alrewas. A map of the land owned by Rider is held by Staffordshire Archives. Maria and Frances jointly inherited their father's estate on the death of their mother in 1759 and they were probably well provided for. Frances appears to have relinquished the house to Maria who remained there with her new husband. Samuel Hemming died in 1785, and Maria in 1789 leaving the house to her sister. 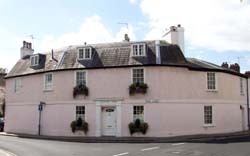 Frances had been widowed in 1762 and appears to have returned to Twickenham, leasing the house later known as Devoncroft, at the top of Oak Lane opposite her sister. She moved back into the house, which she bequeathed to her son Thomas who died intestate so that it came into the possession of her daughter, Frances (c1760-1820, who had married William Henry Haggard Junior (1757-1857).. In due course Frances Haggard's son, William Henry Haggard the 3rd (1783-1843), inherited the property. He married Elizabeth Meybohm and their son, Sir William Meybohm Rider Haggard (1817-1893), squire and barrister, and his wife, a poet, Ella (d. 1889), daughter of Bazett Doveton, had 10 children, of whom the eighth was Sir Henry Rider Haggard (1856-1925), author, inter alia of the novels King Solomon's Mines and She. Nearby Haggard Road commemorates the family into which Claudius's granddaughter Frances Amyand married in 1781. The Haggard family adopted the name Rider, so identifying their descent from William, a respected resident of Twickenham who had been a churchwarden in 1751 and 1752. In 1879 Amyand House was purchased and donated by Elizabeth Twining for the use of the medical Superintendent of St John's Hospital. The hospital was built on the land attached to the house.